Abu Dhabi, United Arab Emirates: The pinnacle of world triathlon, the ITU World Triathlon Abu Dhabi, will start next year’s World Triathlon Series and entries are now open to the public via AbuDhabi.Triathlon.org. This time the highly anticipated event will take place at the emirate’s signature sporting venue, Yas Island, on 3 and 4 March 2017where professionals, serious amateurs and first timers will all compete on the same course as World Champions and Olympic medallists – many of whom competed in Rio. The World Triathlon Series’ dramatic wrap up in Mexico last month culminated in the legendary Spaniard and two-time Abu Dhabi Champion, Mario Mola, taking home his first World Series title. Mola was followed by GB’s Jonathan Brownlee who also competed in the ITU World Triathlon Abu Dhabi in 2015. The past two years has seen the ITU World Triathlon Abu Dhabi host the sport’s biggest stars, including four out of the six Rio medallists – 2015 ITU World Triathlon Abu Dhabi Champion, Gwen Jorgensen (USA); Nicola Spirig-Hug (Switzerland), Jonathan Brownlee (Great Britain) and Henri Schoeman (South Africa). “We watched them race in Rio and now triathlon’s top elite stars will be back in the emirate to vie for one of the world’s most exciting and sought-after triathlon titles. Together with triathlon’s greatest athletes we hope to develop a legacy that inspires UAE’s future stars of the sport,” added Al Awani. For the first time on Yas Island a pinnacle world triathlon event will take participants around the whole island giving them the experience of a lifetime as they enjoy breath-taking views of magnificent landmarks, including the prestigious Yas Marina Circuit F1 track, whilst making their way to the finish line. “We are delighted to be the host destination of the ITU World Triathlon Abu Dhabi 2017 and to welcome the world’s top triathletes who will be kicking off their season right here in Yas Island. Over the past few years the Island has hosted a variety of top-level sporting events, attracting both elite athletes and sporting enthusiasts, who are drawn to the unparalleled closed-circuit environment making the island a prime destination for large-scale sporting events. The event will see participants and spectators experience unique routes and hospitality respectively through the Island’s key attractions and parks, bringing to life the outstanding entertainment and visitor experiences on offer,” said Mohammed Al Zaabi, CEO of Miral, the island’s destination management company. “With the announcement of this iconic event, Yas Island aims to continue encouraging the Abu Dhabi and wider UAE community to lead a healthy and active lifestyle. There will be activities for all age-groups and fitness-levels to get involved in over the weekend of 3 and 4 March,” added Al Zaabi. For the first time, organisers have launched a limited number of early bird entries for the two-day triathlon available on AbuDhabi.Triathlon.org until spots sell out or by the 3 Novemberdeadline. Starting from just AED 405, race spots are expected to be snapped up quickly by keen triathletes and first timers alike. 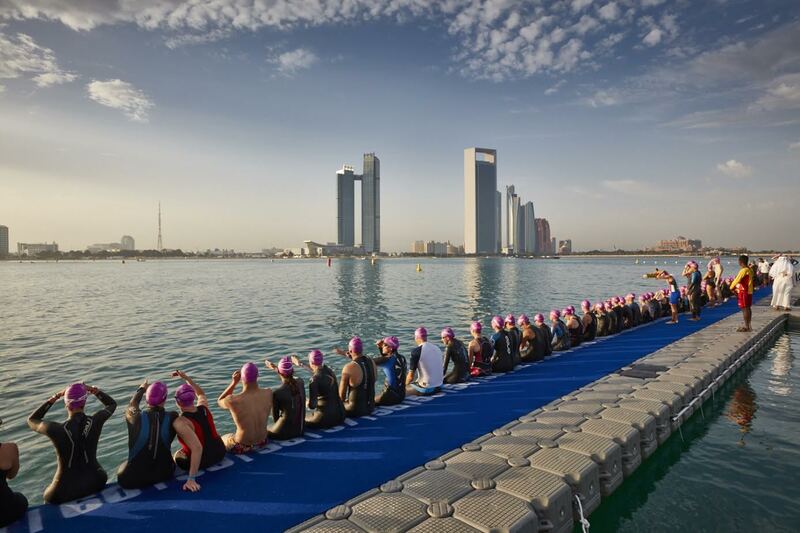 The ITU World Triathlon Series made its debut in Abu Dhabi in 2015 and the third edition of the season opener is set to be even bigger and better with a variety of course options to suit a range of abilities. The race features the following course options: Sprint (750m swim, 20km cycle, 5km run), which is the perfect starting point for beginners, Olympic (1500m swim, 40km cycle, 10km run) and Maxi (1500m swim, 80km cycle, 20km run). All course options can also be completed as a team relay allowing each participant to complete the discipline they are most comfortable with. The relay format makes the triathlon very manageable for first-timers, giving them a great introduction to the sport and the chance to enjoy participating with family and friends. The 2017 event also sees the return of the Junior Triathlon – a fun event aimed at encouraging youngsters to get active. There are four entry categories for the 2017 edition, open for children aged 5 to 15 years, which include: the ‘Mini 1km’ – a 1km run for 5 – 8 year olds; the ‘Kids Duathlon’ – a 3km cycle and a 500m run for 7 – 9 year olds and 10 – 11 year olds; the ‘Junior Duathlon’ – a 6km cycle and 1 km run for 12 – 13 year olds, and a 6km cycle and a 1.5 km run for 14 – 15 year olds; the ‘Junior Triathlon Super Sprint’ which consists of a 400m swim, 10km cycle and a 2.5km run for 12 – 13 years and 14 – 15 years. Early bird prices start at AED 54 with limited spots up for grabs until 3 November. “The two-day triathlon event is not only aimed at elites and serious triathletes – it is a family-friendly affair that has something to offer to all members of the family including little ones and aspiring youngsters. Let World Champions and Olympic medallists inspire your children; sign them up for a fun challenge today and take advantage of the early bird prices,” commented Marescia. Online registrations for the 2017 ITU World Triathlon Abu Dhabi are now open to the public via the race website, AbuDhabi.Triathlon.org. Part of the International Triathlon Union (ITU) and a World Triathlon Series (WTS) season opener, the ITU World Triathlon Abu Dhabi has become one of the highlights of the UAE’s sporting calendar since its inaugural event in 2015 and has grown to become the Gulf region’s most popular annual challenge for professionals, seasoned triathletes and first-timers alike. In 2016, the event’s second edition, the ITU World Triathlon Abu Dhabi sold out to a total of 2,200 triathletes spanning 52 nationalities including 130 of the top elite men and women from 47 countries competing for line honours. In 2015 and 2016 the event was headquartered at the Abu Dhabi Sailing & Yacht Club on the breakwater opposite the Abu Dhabi Corniche. In 2017, the ITU World Triathlon Abu Dhabi will expand to a two-day event taking place on 3-4 March 2017 and it will be staged at Abu Dhabi’s iconic Yas Island. The event is expected to witness over 3,000 athletes descend on the Island across elite, age-grouper and junior races. For the very first time a world-class triathlon will encompass the whole island giving participants an experience to remember. The ITU World Triathlon Abu Dhabi is truly a race for everyone – from novices taking on the challenge for the very first time to returning professionals aiming to beat their best personal record. The Council also hosts and supports the staging of international world-class sporting events. These include: the annual Abu Dhabi HSBC Golf Championship; the Formula 1TM Etihad Airways Abu Dhabi Grand Prix; the ITU World Triathlon Series; both the Abu Dhabi and Gary Player Invitationals; the FIBA 3×3 World Tour Final; the Red Bull Air Race; the Mubadala World Tennis Championship; the 2017 and 2018 FIFA Club World Cups; the 2019 AFC Asian Cup UAE and the UCI WorldTour event, The Abu Dhabi Tour. The ITU World Triathlon Series was introduced in 2009, creating a series of world championship races rather than a single-day world championship. From 2009 until 2011, it was called the Dextro Energy Triathlon ITU World Championship series, but was re-branded in 2012 as the ITU World Triathlon Series. The world’s top triathletes will compete head-to-head for rankings points that determine the overall ITU world champion, with media and fans able to watch from everywhere with a live international broadcast feed available from every event. The International Triathlon Union is the world governing body for the Olympic sport of Triathlon and all related Multisport disciplines including Duathlon, Aquathlon, Cross Triathlon and Winter Triathlon. ITU was founded in 1989 at the first ITU Congress in Avignon, France. Headquartered in Lausanne, Switzerland, ITU also has offices in Vancouver, Canada and Madrid, Spain. It now has over 160 affiliated National Federations on five continents and is the youngest International Federation in the Olympic Games. Triathlon was awarded Olympic Games status in 1994 and made its Olympic debut in Sydney 2000. Triathlon is also featured in the Asian Games, Pan American Games and Commonwealth Games. Paratriathlon was accepted into the Paralympic Games in 2010 and will make its Paralympic debut in Rio 2016. ITU is proudly committed to supporting the development of the sport worldwide through strong relationships with continental and national federations, working with its partners to offer a balanced sport development programme from grassroots to a high-performance level.